Nothing is set by being submitted as a Member’s Bill – first it has to be drawn, and the odds are against that. Then if it is drawn it needs to pass through Parliament. Is this trying to fix a problem that doesn’t exist? English has long been the de facto official language. Māori was also made an official language, in 1987. And New Zealand Sign Language became a third official language in New Zealand Sign Language Act 2006. The Māori language is hereby declared to be an official language of New Zealand. (4) Where, in any proceedings, any question arises as to the accuracy of any interpreting from Māori into English or from English into Māori, the question shall be determined by the presiding officer in such manner as the presiding officer thinks fit. It’s quite clear from this that it was intended that Māori and English were to be co-official languages. A New Zealand First policy and claimed bottom line of showing major sports events including All Black test free to air looks to be a non starter with the incoming government. Kiwis are forking out nearly a billion dollars annually to fund sport and recreation but can’t get any payback with free on-screen broadcasts of sport, says New Zealand First Sport and Recreation Spokesman Clayton Mitchell. “In 2015 councils around the country spent $873 million on sport and recreation and taxpayers provided another $85 million to provide the best coaching and support our athletes required. “But when our sports stars feature live on screen most Kiwis don’t see them because they do not subscribe to Sky. “This is doubly unfair because Kiwi taxpayers support state television and then pay again to a private company for live sports broadcasts. “To sort out this injustice, New Zealand First will ensure major domestic sporting fixtures, World Cup matches and Trans-Tasman grand finals with Kiwi teams and sports people, are back live on our screens in free-to-air broadcasts. “All Kiwis should be able to see our sport stars when they compete,” Mr Mitchell says. Sports fans aren’t going to be able to watch major events live on free-to-air television, despite the best efforts of NZ First MP Clayton Mitchell. Mr Mitchell drafted the member’s bill to amend the Broadcasting Act and on Wednesday night it came up for its first reading. Parliament adjourned just before a vote was taken, but with National and Labour opposing it there’s no doubt about the outcome – it will be heavily defeated. “This is important, it’s about treating all New Zealanders fairly and equally,” Mr Mitchell said when he kicked off the first reading debate. Government MPs said the bill was “populist pandering”. “Nothing is free, someone has to pay for it,” said Brett Hudson. Labour’s Trevor Mallard said there was no way the bill could pass. June (NBR): NZ First MP says free-to-air sport will be an election issue. Newshub tonight showed footage of an old, unpublished interview in which the NZ First leader promised he would make significant sporting events free-to-air. Speaking at the Karaka race horse sales in January this year, Peters told Newshub that “I’m not going to say we’re going to try and implement it – we will implement it”. Amend the Broadcasting Act to recognise sport as part of the New Zealand identity and to broadcast Games of National Significance live and on free-to-air television. Labour has ruled no-deal on the possibility of free-to-air All Blacks’ tests, or other major national sporting events. NZ First leader Winston Peters earlier in the year said a law-change to provide free-to-air rugby would be the price of NZ First’s support in forming a government, though it’s one National is believed to have also refused to bend on. Labour has moved to scotch any anticipation the policy might be written into the final agreement, following comments from NZ First sports and recreation spokesperson Clayton Mitchell that it was “still on the table”. Mitchell said in the interview on Saturday it was discussed in coalition talks, and the prospect of Kiwis getting free-to-air access to significant sporting games was still on the table. A spokesman for Prime Minister-elect Jacinda Ardern has confirmed it was not in the agreement. I had serious doubts whether this policy would survive common sense negotiations. I’d love more free-to-air sport but I don’t think the Government should be financing it. Mixed messages coming out of the parties going into Government together. Ardern has also said that Labour policy on immigration remains intact, meaning drastic reductions promised by Peters also look like not happening. It was inevitable that some NZ First (and Green policies wouldn’t make the cut). Details of the governing agreements will be released on Tuesday, but some are being leaked. There are two very good things about the progress of Jan Logie’s Domestic Violence – Victim Protection Bill – it is an Opposition MP’s genuine attempt to make a difference in the battle against the scourge of domestic violence, and it is an excellent example of how MPs from all parties can work together on a common worthy cause. I have to first acknowledge my dear colleague Jan Logie, who is an absolute champion for women, and I have to say, Minister Amy Adams, I am actually rather taken aback by the emotion you expressed at the end of that speech. I have to say for many women in the House, this is a very personal issue. I just want to tautoko my daughters and granddaughter in the gallery. Heaven forbid that anything that happens to many of the women in our country happen to those beautiful children up in the gallery. I must acknowledge Heather Hēnare, champion of this particular cause and supporter of many victims of domestic violence. Your work will go on and you will continue to be recognised for the amazing work that you do. What this bill, I believe, attempts to do is to really start to normalise the conversations that we must be having in each and every workplace about domestic violence. It must bring it down to the point where we stop being scared of opening the door and shining the light on what is going on in many of the families that we occupy—that we live in. Each of our families is touched in some way by the abhorrence of domestic violence: whether we are impacted personally, whether our children experience it, and whether we are supporting our sisters and our brothers through difficult times. I too join in the line-up of people here today who are very pleased to be speaking in support of this bill, the Domestic Violence—Victims’ Protection Bill, in its first reading, to see it through to the select committee stage to have some honest conversation about how we move we forward in protecting women, the majority of women who are subject to domestic violence, and those men the workplace. I am pleased that Jan Logie has referred this bill to the Justice and Electoral Committee. I think that our committee is up for the challenge to have these discussions, and, as I said before, I am very pleased to be part of this movement right now that has unanimous support in the House. (b) that she would receive unanimous support to see this bill through to the select committee phase. So, well done, Jan, for championing this, and well done for that achievement. It gives me great pleasure to stand on behalf of New Zealand First to, first of all, acknowledge you, Jan Logie, for bringing this bill to the House. With tongue in cheek and with serious sincerity, I think divine intervention has played a little part in this. Being International Women’s Day today says a lot, and the only time I have seen that happen again was with Sue Moroney’s bill when it was to do with paid parental leave. It was just again that the stars aligned, so well done and great courage. It just goes to show that the passion that you have for resolving this comes through with your speech and you speak very, very eloquently of that. I would also like to acknowledge the Minister for her words and her sincere thoughts, along with all other members who have spoken here today, and it gives me great pleasure as a male to stand up and speak to this. There is no doubt that domestic violence is an absolute scourge on our society. There is absolutely no doubt in my mind that, firstly, we need to do absolutely everything we can to eliminate it to ensure that we do not have victims of domestic violence in New Zealand but also that, secondly, we as a society need to do everything that we can in the meantime to support victims of domestic violence…. …I also just want to acknowledge the delegation of people who I had come through my office door in Palmerston North a couple of weeks ago, the local representatives from the National Council of Women of New Zealand. I am really happy to support this, at least at this stage, to ensure that we have that very positive discussion, because, as I said when I opened this speech, it is clearly incredibly important that we not only eliminate domestic violence from our communities but do everything we can to support the victims of it, and I commend this bill to the House. At the outset, can I first of all acknowledge that this is International Women’s Day. What better day to be debating this bill than International Women’s Day, which is a day when we all stand in solidarity with women right across the world in order to, yes, celebrate how far we have come, but also pause and think about what we have yet to do. This bill clearly falls into the latter bracket. I want to congratulate the member Jan Logie on her foresight in bringing this bill forward…It is the ballot goddess at work again to make sure that this got debated on International Women’s Day, because, sadly, this is an issue that does affect women, in more numbers than it does men. In fact, what we would wish is that it affected nobody. I agree with the last speaker, Jono Naylor, in that all of us would want to not be dealing with this end of domestic violence. All of us would want to be putting our energy into preventing it from happening, and that is the world we really want to live in: where there are respectful relationships and people can deal with the pressures in life and the stresses in life without battering the people closest to them, the people who should be able to rely on the love and support of family members, but instead are hurt and have violence meted out against them from the people whom they should have the most trust and warmth and understanding from. Sadly, that is not the world we live in, and I will not rest until we actually address the front end of this, and actually stop that domestic violence from happening in the first place. But it does happen, and so this bill is going to be something that will be a huge relief for those people, predominantly women, whom this happens to. Can I firstly acknowledge the sponsor of the bill, Jan Logie. I was not privileged enough to see her first reading speech, but I understand it was quite a remarkable speech, and I want to pay tribute to you, Ms Logie, for your sterling work in bringing this bill to the House. …one of the things I have been very privileged to have done since I became an MP just over 2 years ago is to go and spend time with our women’s refuge in the Hutt and to deliberately get out there into the community, to some of our marae and to some of those community organisations that are dealing with the front end and the hard edge of this issue. One of the things—I suppose the biggest lesson—that I have taken away from those visits and those conversations is that the size of the problem is truly remarkable. You know, it is just almost unfathomable, the extent of violence—almost always by men against women—in our communities. As Minister Amy Adams said in her excellent speech, which I watched in my office, it is not just going to take the Government to do something about this problem; it is a whole-of-society issue that we need to address. The Government will do its bit and we will lead on this, and I hope, actually, that we will look back on the 2014 to 2017 Parliament and people will say that that was the Parliament—the 51st Parliament—when the New Zealand Government and elected representatives got serious about family violence. I would like to start where others have started, by congratulating the member in charge of this bill, Jan Logie. She was very humble in her first reading speech, by recognising that the work—as is always the case with these things—started outside Parliament with Women’s Refuge, with unions bargaining for changes through collective bargaining, and with all the other groups that, I am sure, have worked closely with Jan Logie on formulating this bill. But the truth is it does actually take someone in this Parliament to put the bill into the ballot, and then, when it comes out of the ballot, to actually champion it, to have the negotiations and to work with colleagues around the House, especially the hard work to get to the point where it appears we will have unanimity when we come to the vote on this first reading. So I want to acknowledge that work by Jan Logie. We all like to be humble in this place, but we have a job to do, and when those opportunities come up—when that bill comes out of the ballot—it does take a lot of work to get to the position that this bill has got to. So congratulations to Jan on doing that. I also want to acknowledge the Minister of Justice, Amy Adams, for her leadership, because—I will say this gently, and like the previous member, Chris Bishop, I do not want to be party political—the Government’s initial response was negative. I think it’s reasonable for Lees-Galloway to bring this up but god of him to say it ‘gently’ in the context of general cooperation on this Bill. The Government’s initial response was that this would cost too much, and Michael Woodhouse, as the Minister for Workplace Relations and Safety, stated that on the record. Clearly, some conversations have gone on within the National Government, aided, I am sure, by the lobbying from the member in charge of the bill, and it is pleasing to see that Amy Adams’ leadership has won through and the Government has decided that this is a worthy piece of legislation to at least take to a select committee, where we can have the conversation. I too stand in support tonight of the Domestic Violence—Victims’ Protection Bill, in the name of Green Party MP Jan Logie, and I add my congratulations to Miss Logie on her initiative in writing this bill and also on her good fortune of having it pulled from the ballot. I did hear her speech tonight. It was an impassioned speech, and I congratulate you, Miss Logie, on your dedication to this cause. In my own conversations with NGOs that work with victims of domestic violence, there is a clear need to support women at work who have fallen victim of domestic violence. For women who work in front-line roles where they must interact with the public, it is essential for them to have their privacy protected, especially if a woman bears the marks, the bruises, the impacts from a domestic violence episode. Also at work an abuser makes it very easy for a woman to be trapped, to be captured in her workplace, and to become yet a further target for abuse. The most effective way that an abuser does that is through violent or abusive phone calls or emails. But also it becomes a risk for others in the workplace, and thereto lies the impact for employers making their workplace a safe workplace. It gives me hope to stand up tonight, after having listened to all the speeches in the House. I could think of it as personally gratifying that this bill, with the community we have brought to the House, has support. But mostly what I am feeling is the message that you are sending to survivors in the country, that we are, together, committed to making their lives better. We have heard their experiences and we are committed to making their lives better in every way that we can. I think that, for me, at least is a moment to mark in time. I have heard really clear support for wanting to eradicate domestic violence, for us to use what tools we can as a country to do that, and to support the victims and survivors in the meantime. I have also heard a very clear articulation from all members in the House that yes, this is not just the business of Parliament or Government. All of us have a role to play in that, and that part of being a good employer is caring for your staff, and that this is one way to do that, and it will pay off for businesses. I have heard mention that there needs to be some work around the drafting of the bill. I am really happy to acknowledge that. Part of the reality of it was that I had different legal opinions on the current status of the law in relation to flexible working hours, but particularly in relation to the Health and Safety in Employment Act and the extent to which it covered domestic violence. What we have drafted is something—it is quite hard to get something right, when you are not actually sure of the status of the existing law. I really do see it as an offering for us to be able to work together to come up with the best solution. When we are all on the same page about the outcome, then that gives me hope that this process is going to get the result that we need. I will say it again—it is a result that could save lives, so it is absolutely worth hanging on to. I did appreciate the comments that maybe we could loosen up a little bit. It is not something that people usually suggest to me. The flexible working arrangements and the need for the domestic violence documents in here were based on some legislation from overseas, in the UK. But yes, we do not want to make it more difficult. We want to clarify that flexible working arrangements should be used and should be available, and that that needs to be visible, I believe, to be able to have that intent realised. But we do not want to make it more difficult. Somebody did mention the point about the fact that perhaps this would be too onerous for small businesses, and I thank the member Iain Lees-Galloway for asking businesses to come with solutions, if that is a concern for them. But I am going to push quite hard on this, because the international research—in Australia 1.6 million workers are already covered by these provisions, and for most of them, although the provisions are there they do not take them. It is very rare. They will take some. They take what they need. It is not a mandatory 10 days. It is up to 10 days, and you use it when you need it. The experience overseas as well as in businesses here is that people do not exploit that. It is a relationship of trust that is working. I would want to put people’s minds at rest on that point. In the final few seconds—just for all those people who have been fighting for this for so long, and for those women who went back because they had no other choice or felt that they could not get out, I hope tonight gives you some courage. Kia ora. Bill referred to the Justice and Electoral Committee. New Zealand First will have their conference in Dunedin this weekend.The theme will be “It’s time”. Leading into this in an interview with NZ Herald Winston Peters says they will be increasing their focus on the regions – Winston Peters: Regional NZ will be our election battleground. Peters is as good as any politician at coughing and getting media coverage. And he’s better than most at packing halls, but he puts a lot more effort into old style campaigning than anyone else. There has been speculation on Jones joining NZ First for years, going back to when he was a Labour MP. If Jones stood for NZ First in Whangarei he would probably be very competitive there. Peters would not name names but said there were more people interested in standing for NZ First than any time in its 23-year history. “There are seats around the country that we can capture…we have a list of them but we are not disclosing where they are at this point in time. Details perhaps, but Peters has been sharing his plans a bit in this interview. While National is vulnerable to shedding support it’s not just them that NZ First are targeting. NZ First deputy-leader Ron Mark has recently turned attention from National to Labour during exchanges in Parliament, accusing the fellow opposition party of stealing policy. Peters reacted angrily after Little said the party was considering policy that would write-off student debt for graduates who worked in certain public service jobs in the regions – similar to existing NZ First policy. NZ First had been called racist and xenophobic for calling for lower immigration levels in the past, Peters said, and didn’t like to see other long-standing policies “stolen”. He did not think much of the memorandum of understanding between Labour and the Green Party: “It’s not for me to comment on what their political strategy might be. Suffice to say it’s not a winning one”. The memorandum has not been the game changer (yet) that Greens and Labour were hoping for. Greens seem to have hit a support ceiling and Labour have not only failed to recover from an awful result last election, they are at risk of collapsing further. Peters no doubt senses this. Peters continued his long-standing position of not commenting on possible coalition deals after the election. So voters have no idea what he might do, something he keeps getting away – to an extent. It hasn’t worked in getting NZ First into government since 2005. Peters could remind Mitchell about counting kings before the election has hatched. NZ First could potentially get anywhere between 5% and 20% in the next election, with 8-15% looking quite doable. They are attractive to the disgruntled and disillusioned, but their biggest asset, Peters, is also their biggest deterrent. He is good at picking up protest votes but recent elections have shown an electorate reluctance to crown Peters with the power to dictate. Clayton Mitchell, NZ First spokesperson on Conservation, has said that “the cost of keeping the entire country predator free and maintaining it would see a capital expenditure cost of $1.67 trillion and an operating cost of $91 billion per annum”. A predator-free New Zealand by 2050 is likely to cost trillions, not millions as the government claims, says New Zealand First. “The National government’s promise to make New Zealand predator-free for the bargain price of $28 million is nothing but greenwashing,” says Conservation Spokesperson Clayton Mitchell. “Zealandia, a predator free plant and bird sanctuary in Wellington, cost $17 million to set up with an operating cost of $867,000. “Using these figures as a yardstick, the cost of keeping the entire country predator free and maintaining it would see a capital expenditure cost of $1.67 trillion and an operating cost of $91 billion per annum – as New Zealand is 98,000 times larger than Zealandia. “The operating cost alone would be 40% of New Zealand’s GDP. “According to the Conservation Minister, the private sector will be willing to share the burden with additional funding. “The government’s targets are totally unrealistic. “New Zealand First recognises that the preservation and enhancement of the environment requires sound economics. “Unlike National we believe that we must set appropriate and realistic environmental goals,” says Mr Mitchell. David Farrar calls this as “may be the stupidest release put out by NZ First since they complained about the Reserve Bank being owned by foreigners” and there’s a few uncomplimentary comments too under Meet the future NZ First Minister of Finance. A thought to think about as we go into new sporting events and, of course, the 2020 Olympic Games in Tokyo are the people who paid and enabled this event to take place, and who put our sportspeople on the international stage so that we can swell with national pride. We should have given them the ability to watch these games of national significance live and free to air, as we once enjoyed in previous times gone by. We would like to see this House support that as it comes up in the future. It is affordable, and I think, if you ask the people who stay in touch with New Zealanders, there is a huge desire for it. So he wants “games of national significance live” free to air. Coverage of the Olympics is anything but free. But he didn’t do any costings -it shouldn’t be hard to come up with a rough estimate of trillions. David Farrar tries to laugh about dwarf throwing in a Herald profile of NZ First MP Clayton Mitchell in Profile of two NZ First MPs. But that’s minor compared to comments where there seems more serious intent, with the applauding of chasing and beating up, and the promotion of a shoot on sight police force or army. These aren’t Farrar’s views but they are enabled through his liberal freedom to speak policy. An MP received a suspended sentence following a fight with a gang member who attacked him after being refused entry to a bar. First-term NZ First MP Clayton Mitchell, 43, has reluctantly spoken about the incident, which occurred 18 years ago. Mr Mitchell was in charge of the city’s Straight Shooters Bar in 1997, when a gang member with facial tattoos was refused entry. Mr Mitchell, who went on to get a black-belt in judo and has taught boxing and women’s self-defence classes, said the man then told him he was going to get a gun and would return to finish him off. He now realises he crossed a line in following the gang member, he said, but at the time was in fear for his life. “I followed him. I told the staff that were there to call the police, which they did, the police arrived, and by the time they had arrived I’d run up and gave him a beating, basically, gave him a bit of a boxing lesson. It’s hard to imagine what it would be like being caught up in a violent situation like this, but Mitchell concedes in retrospect that he crossed a line. Not so some of the Kiwiblog commentariat. I am impressed by Clayton Mitchell. It is an outrage he has a record albeit a suspended sentence for what he did to a gang member who attacked him when other people with better connection get discharged without conviction and permanent name suppression for much more serious offenses. 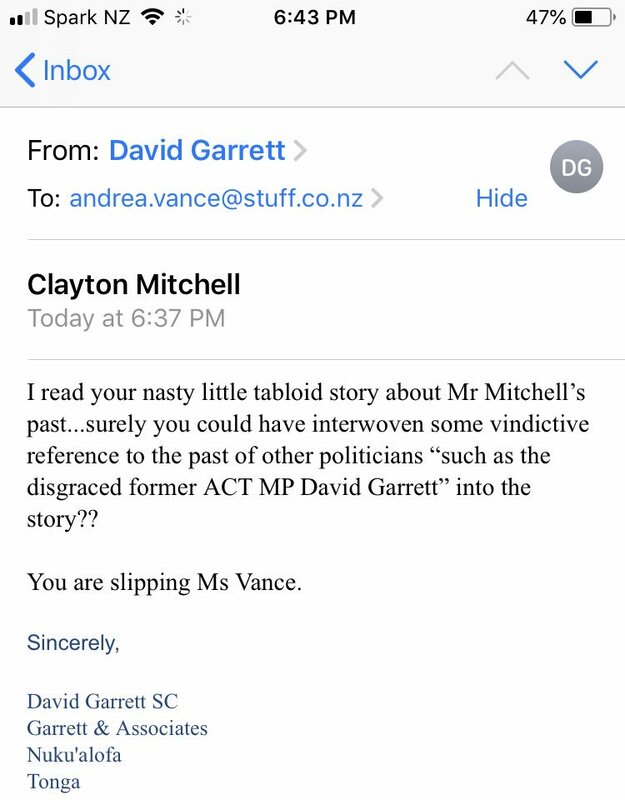 Clayton Mitchell sounds like the sort of thug who should be locked up. He chased a retreating person down the street and beat him up. Scumbag. Threatening to come back with a gun and shoot you isn’t retreating the gang member is lucky he only got a smack in the head to be honest. More assumptions, plus trying to justify chasing someone and beating them up. Really? I am just reading the story at face value. If correct the “thug” should have received a commendation. Are you serious, or simply trolling for attention? Is Syrlands serious or just jumping on the bashwagon? I’m happy to be in the minority, but I don’t agree that this thug should be congratulated for dispensing his version of street justice. I presume the sentencing judge was well aware of all of Mitchell’s whiny excuses, namely: ‘he started it’, ‘but but but he’s in a gaaaaanngg’, ‘he threatened [threatened being the operative word] to get a gun’, and ‘he’s bigger than me’ (seriously!). Good on him. Good to see an MP with balls and the willingness to use them. In all honesty I can only think of half a dozen National members who wouldn’t shy from the spineless “don’t take the law into your own hands” doctrine beloved of our pro-criminal Police force and it’s wishy washy PC liberal apologists in Government (and yes I do mean the current Government). Patched gang members should be rounded up and exterminated by the army. Just lifetime criminals who have declared war on civilised society. If chase and beat the crap out of and shoot on sight were allowed and encouraged as some here wish then with 3 strikes we’d probably end up with a rapidly expanding prison population and increasing collateral damage of innocent people. The problem with sanctioned thuggery, summary justice and vigilantism is you end up with an uncivilised society that adversely affects everyone. Escalated violence in society can’t be ring-fenced. PG: I am not advocating – even half seriously – “shoot on sight” for the general public…that would lead to mayhem, and war on the streets…but I quite seriously regard gangs as behind the worse things in our society, starting with P manufacture…there are no “independent” P manufacturers, they are all controlled by gangs. If, as RRM suggests, the army was tasked with eliminating them, how long to you think they would last? A week? Of course it’s never going to happen, but one can fantasise…Do you disagree that the country would be a much better place without organized gangs? Allowing the army to shoot on sight to eliminate anyone deemed a gang member from a distance is as stupid a thing I have seen you support. 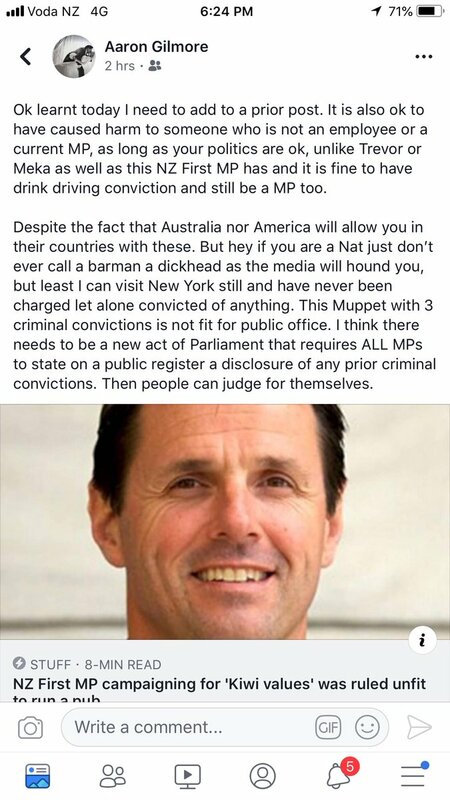 I agree there are some lowlife criminal scum around, far too many of them. But lowering justice to their level (that is zero judicial process) is a terrible way to deal with it. Of course the country would be a much better place without organized gangs – but you don’t realistically think they could be eliminated without collateral damage do you? Despite the problems we have I like New Zealand because it’s like New Zealand, and not like Syria or Mogadishu. I asked Garrett: DG – you’ve researched justice in different parts of the world – can you give some good examples of countries where an army has been used to successfully eliminate all gangs? Where it took longer than a week would suffice. I don’t think we need shoot on sight policy for gangs. I would propose that as they put themselves outside the law all gang members should be considered fair game and there should be no legal consequences for any action against them. Not everybody has a firearm, so we need to consider other solutions to the problem, such as running them off the road on their bikes or bulldozing their properties. Of course this doesn’t preclude shooting, but there are many ways to skin a cat. It’s hard to know how serious those suggestions are. No one has ticked it up or down yet. The best way to eliminate gangs is to cut off their money. The best way to cut off their money is to treat drug use as a medical problem (when it is even that) instead of a crime. That wouldn’t eliminate gangs, the criminally inclined will always find ways of selfishly shitting on society, but it would substantially limit their income opportunities and their adverse influence on society. It would also be far more likely to retain a relatively decent society and maintain reasonable standards of justice.